First some bookkeeping. I haven’t had the time to try to switch to 1.1.3/1.1.4 (even to read details about the complexity of doing so). I just found it too cumbersome to reinstall all these wonderful Apps after the 1.1.2 upgrade. There also isn’t anything in these upgrades i had any urge to install. Hence i decided to wait until the official SDK was available (seem this shouldn’t take too long, we’ll definitely should know on March 6th) and then re-evaluate if it makes sense for me to upgrade. Since it looks like jailbreaking an early 16G iPod may cause some problems i guess i made the right decision. So my greatest fear right now is that some iTunes update somehow changes the setting from manuall updating to automatic updates. (Nearly every iTunes update does reset my manual CD import settings back to Apple’s preferred way of doing it: AAC). This information would definitely not justify doing a blog post. But there is actually exciting news to report. In order to provide some relief for these issues, I have decided to start a project called Telesphoreo with the goal of creating a distribution of GNU and BSD’s userspace for the iPhone as a collaborative, open-source project. The name is an ancient Greek word meaning “to bring fruit to perfection or maturity”, which I feel is what needs to be done to Apple’s product: it’s passable as a phone, but as a portable workstation it is almost unmatched… with the right software. For distribution, I have chosen Debian’s APT, which I have ported to this new platform along with a few custom tweaks to integrate better with Apple’s network settings. For somebody like me who is usingDebian and Ubuntu on a number of machines (be it physical or virtual) this is extraordinary news: APT and the whole ecosystem around it are simply the best package management i’ve seen so far. To bootstrap this effort, I have already ported well over a hundred projects: everything in scope from bash to xeyes, along with a number of supporting libraries and scripting languages (including more functional copies of Ruby and Python than are currently available via Installer [emphasis added]). All of the source modifications I have had to make, as well as the build scripts for compiling it all, are available via its subversion repository. 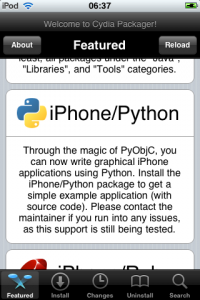 This packages include a port of PyObjC (the Python – ObjectiveC bridge that is a prerequisite in order to being able to build Python based Apps for the iTouch) as well as UICaboodle.py (iPhone specific PyObjC extensions) and iPhone/Python (example applications (with source) in Python. This is exceptional news. I ever hoped that somebody will tackle this. Now i have no longer any excuse whatsoever. 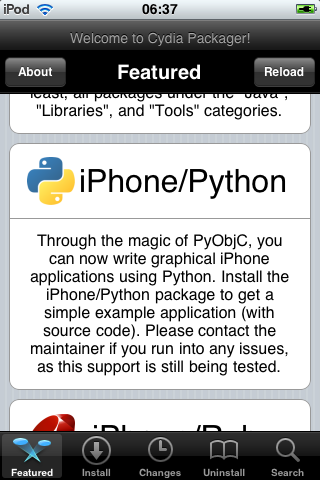 to not have a closer look at PyObjC and how to build native Python Apps for MacOsX and the iTouch. In order to simplify the process of upgrading the iPhone’s firmware without the loss of personal data, Apple has organized the disk space on these devices into two partitions, mounted at / and /private/var (which is symbolically linked from /var). The former partition only 300MB large, and is mostly taken up by Apple’s software. Unfortunately, it is also the primary location where third party applications are installed. To help with this problem, if Cydia’s installation detects enough disk space on your other partition (where the rest of your 4-32GB of space is allocated) and verifies that these files haven’t already been moved by a utility like BossTool it will go ahead and transfer all of your Applications, Wallpapers, Fonts, Ringtones, and Shared data over to the larger partition, freeing almost 150MB of space. 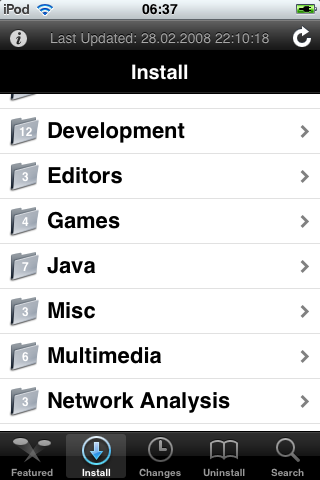 Store the sum of human knowledge on your iPhone/iPod Touch — an offline copy of Wikipedia that requires no ‘net access. 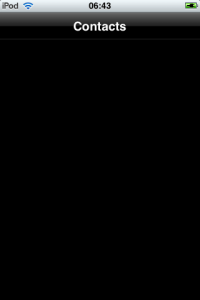 S3FUSE is a FUSE based filesystem written in python that uses SDB for metadata and S3 for document storage. 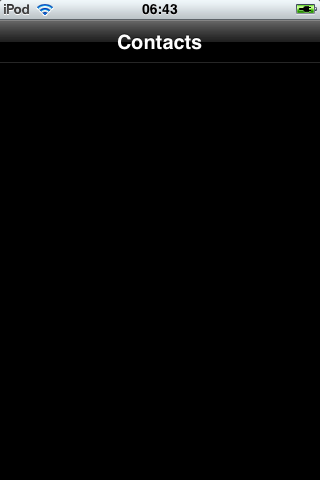 Using these scalable services available from Amazon, it is possible to mount a user-land filesystem on Linux and FreeBSD. s3fuse is a filesystem in userspace (FUSE) that uses the Amazon S3 web service to store data. Amazon’s S3 is a nice and cheap way to have a remote backup system. But it is REST based which make it not very easy to use. This project just add the normal file system semantic to it. it use the boto package for communication with Amazon S3 service.